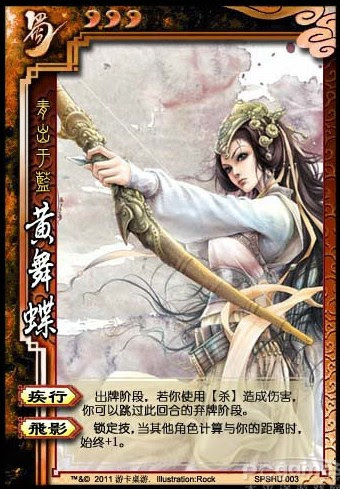 If Huang Wu Die causes damage with an attack during her turn, she can skip her discard phase. Whenever other players calculate distance to Huang Wu Die, this distance is increased by one. To use "Fleet of Foot", Huang Wu Die must cause damage with an Attack. Any type of Attack will suffice, but damage caused with tool cards will not activate the ability. "Shadow Runner" effectively gives Huang Wu Die a bonus +1 horse.